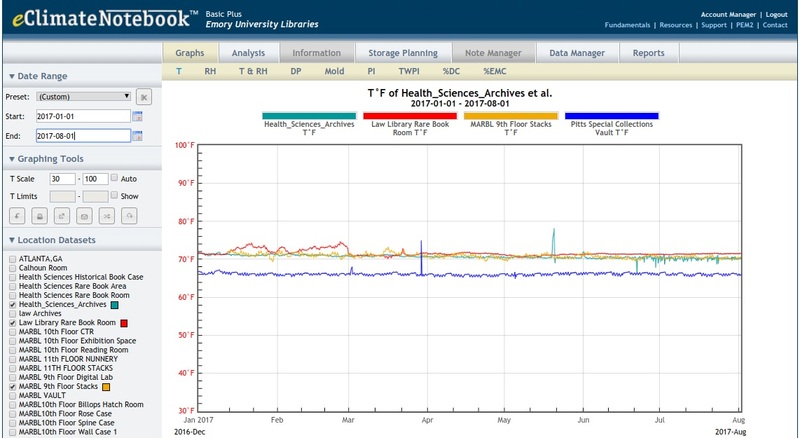 Emory Libraries Preservation Office is responsible for monitoring the environmental conditions (temperature, relative humidity, and light levels) of all libraries on campus. 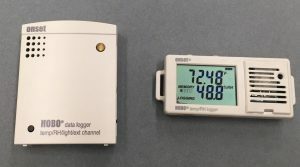 We currently use data loggers to monitor in twenty-seven permanent locations throughout campus: fifteen in the Rose Library, one in the Schatten Gallery, six in the Health Sciences Library, three in the Pitts Theology Library, and two in the Law Library. We also place data loggers in the library on the Oxford campus and in temporary locations such as special exhibits. 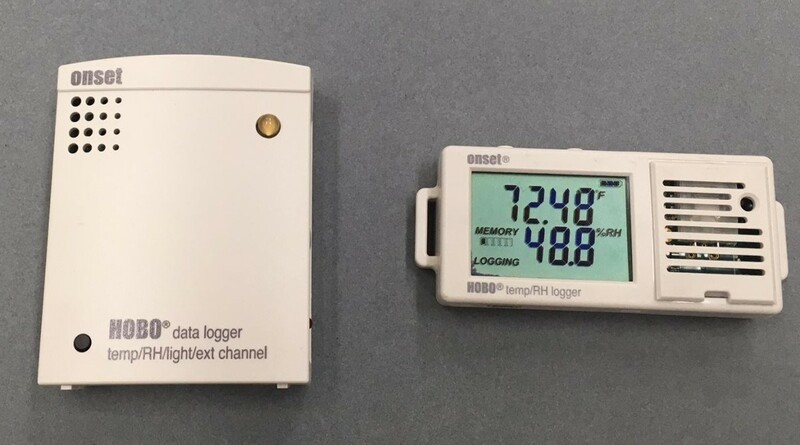 Onset HOBO UX100-003 data loggers monitor the temperature and relative humidity in most locations. In areas where we need to monitor light levels in addition to temperature and relative humidity, for example in exhibition areas of various libraries, we use the HOBO U12 model. All of the monitors remain in place to consistently measure environmental conditions, collecting data every 15 minutes. Every two weeks, the data is gathered by staff and uploaded to the web-based system eClimate Notebook. 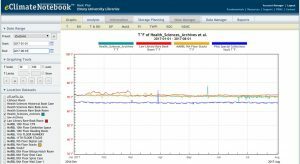 With this information, the Preservation Office and all Library stakeholders may analyze data in a graphical format. More information about this system may be found at eclimatenotebook. 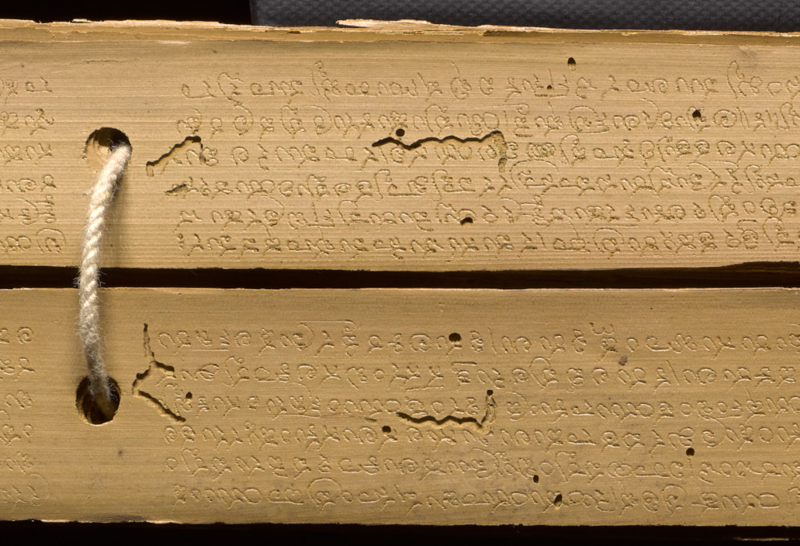 Maintaining stable temperature, relative humidity, and light levels within acceptable ranges is important for the preservation of our book and manuscript collections. A space with high temperature and relative humidity creates an environment ideal for mold growth on collection materials. 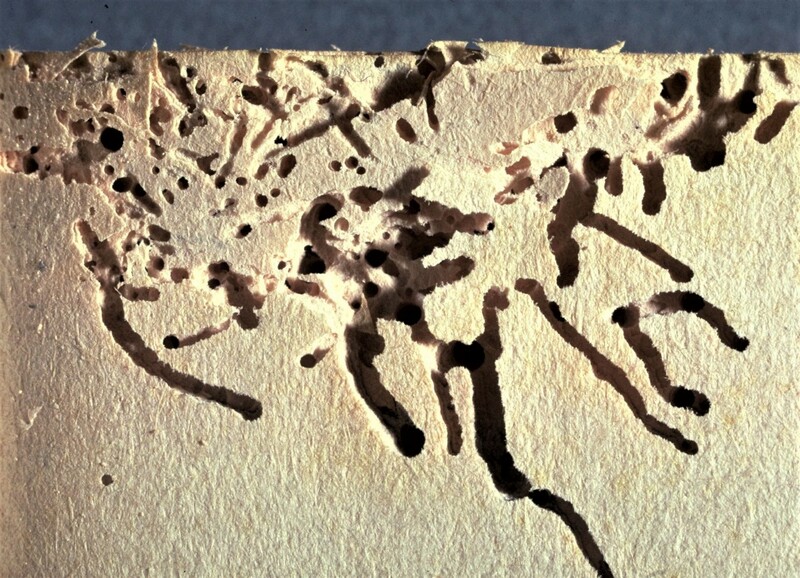 Relative humidity that fluctuates greatly and frequently can cause warping or damage to paper-based materials. It is important to keep light levels (both visible and ultraviolet) low in exhibition spaces. This prevents fading of fugitive inks or dyes on materials that might be exhibited and exposed to light for long periods of time.